"Please Don't Shoot The Messenger!" A Bellman or Town Crier could well be described as the original "historical news broadcaster". In many early settlements and towns, such as Perth, they were the travelling anchorman for the nightly news: a source of daily information and entertainment. Another traditional term, "Beadle", was also a bellman and crier, but usually attached to a parish, to a court, or to a specific judge. Here is Perth we actually had "Criers of the Court" who were "Criers of the Council" (later called "Messangers of the Council") and who also served as Public Criers. The first mention of a Crier may in fact be found in the Bible. Using the Douay-Rheims translation one reads in Genesis 41:43, "And he made him go up into his second chariot, the Crier proclaiming that all should bow their knee before him, and that they should know he was made governor over the whole land of Egypt." Similarly in Exodus 32:5, "And when Aaron saw this, he built an altar before it, and made proclamation by a Crier's voice, saying 'Tomorrow is the solemnity of the Lord'." and Exodus 36:6, "Moses therefore commanded proclamation to be made by the Crier's voice: Let neither man nor woman offer any more for the work of the sanctuary. And so they ceased from offering gifts." These are translations from the Hebrew which interprets literal phrases such as "and they are calling" or "caused a voice to pass" as the word "Crier" and actions of a proclaiming as a Crier does. It is clear that the first full-time Town Criers were the Spartan Runners in the early Greek Empire and as the Roman Conquest spread through Europe the position increased in importance until it became a position of the Court. Generally literacy amongst the majority of the immigrant populace was low well into the late 19th century. Books and newspapers were generally only accessible and readable to a small percentage of the population. Proclamations, edicts, laws and news may well of been written on paper, but they were usually passed on to the general public by the Town Crier - the first (talking) newspaper. Even the emergence of newspapers in the early settlements did not initially reduce the need for a Crier. Newspapers of the early 1800s were largely literary documents containing news from the British Isles. There is little of local or immediate current interest in these newspapers. The official job of Town Crier can be traced back as far as 1066, when news of Britain's first (and last) invasion by King William of Normandy was passed from town to town by individuals specifically employed to call out the King's proclamation. Town criers were protected by law. "Don't shoot the messenger" was a very real command; anything that was done to a town crier was deemed to be done to the King and was therefore a treasonable offense. This followed in the military tradition of the time, where musicians, who were educated and respected carriers of messages and "parlees" across the battlefield lines, were "of" the military not "part of" the military. Their uniforms were bright reverse colored and identified them as non-combatant signalmen, protected from the rages of the battlefield. They were armed with only a small 24 inch long sword. Town Criers made use of many signalling devices to draw attention to their announcements. 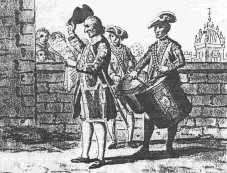 There are many early references to the use of the drum as a primary way of attracting the attention of the crowd. Other references to the use of bugles, hunting horns or other musical instruments are found in European literature and paintings. There are historic references to Town Criers beating on metal pots with large spoons. Beginning about the middle of the 17th century the use of the bell starts to become more and more standardized throughout England but the European tradition of using a musical instrument remains popular to this day. The military traditions of the fife and drum were extremely popular amongst North American settlement groups attached to the military. This continued up till the 1850's when the now traditional bell became prominent. Also in wide use among Highland Regiments was the bagpipes, in fact, they were so popular that the British Military attempted to eliminate their use as signalling instruments starting in 1780. There were orders forbidding the playing of the pipes and drums together, or the playing of the drums in highland style by regimental musicians. Locally, the first reference to Crier using a bell being used in Perth appears around 1842. There are numerous references to pipers accompanying one of the local Crier. Of particular local interest, the Glengarry Light Infantry Fencibles, who were one of the founding regiments of the Perth Military Settlement, disbanded in 1816 and listed 19 buglers amongst their members. This was also true of the Regiment de Meuron and the Regiment de Watteville whose rosters included many musicians. An article in the Brockville Gazette from March 20, 1829 contains the words, "Whenever a man was so unfortunate as to become insolvent, there issued against him a letter of horning, which were write in the King's name, ordering the debtor to pay the debt under penalty of being horned; that is by blowing a horn, after the fashion of a bellman or public crier, of being proclaimed -- what do you suppose ?-- a Rebel! so prodominate was the love of money over every higher motive." Usually people of good standing in the community were chosen as Criers, for they had to be able to write and read the official proclamations. Often they were a husband and wife team with the wife ringing the large hand bell and the husband doing the shouting. There are many historic references to the public crier being a woman. There are also seperate financial references to payments made to "Crier" and "Bell-man" indicating that in some areas two individuals made the daily rounds of the settlements; one drawing the attention of passerbys while the other dealing with the announcements of the day. In the early years of Perth there are reports of as many as three criers working at the same time. The Town Crier would read a proclamation, usually at the door of the local inn, then nail it to the doorpost of the inn. 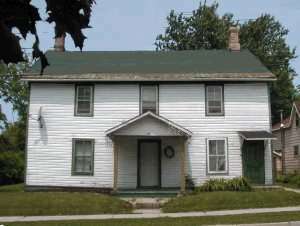 Within the early settlement of Perth notices would be attached to the post of the "The Red House" or to the door post at the Military Superintendent's office across the street. The tradition has resulted in the expression "posting a notice", the "post office", and the naming of newspapers as "The Post". The Perth Courier, Canada's second oldest newspaper, has many references to proclamations being read by a local constable or “Crier Of The Court”. While the paper records the times when these proclamations summoned to the early military settlement to moments of celebration, there is little doubt that many times these announcements were of a more legal nature. The paper also has references to several criers working within the community at the same time. The Court had its Crier and the various Councils of the Town and District had their "Messangers". There were also unofficial "criers" (whom we might refer to today as "actors") who made a living reciting famous speeches or repeating historic monologues for the public. In Perth, the name "David Hogg, Crier" appears in the treasurer's report of the Bathurst Council as published on August 29, 1834. Hogg was an enterprising individual who wore many different hats in the community. There are no records of a Crier(s) proceding him discovered to date, however it is fair to assume there may have been several. The name often said to be the first Crier, Arthur Herald Wiseman, actually stepped into the role in March of 1842 as Crier for the Bathurst Council. 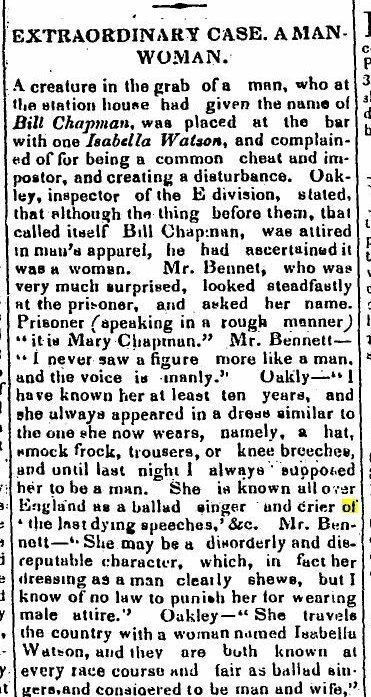 At the same time there was an Anthony H. Wiseman who was a constable, confectioner, auctioneer and became Crier for the Court in 1847. News reports often refer to simply "A.H. Wiseman" often making it difficult to determine which was being spoken about. Each Council and each judge had their own Crier. The phrase "Messanger of the Council" replaced the word "Crier" beginning around 1860. Willam Gill is a name that first appears as Messanger in 1861 and continues for several decades. More information on Criers in Perth can be found by following this link. reafonable rates, reading, writting and finging. N.B. I play the hooboy accafionally, if wanted. draw teth, and fhoo horfes, with the greateft fcil. and coals -- Shoos cleaned and mended. within, or at the horfe fhoo and bell, near the church. on tother fide of the way. N.B. Look over the door for the fight of the 3 pidgeons. N.B. I fell good Ayle, and fometines Cyder--Lodgins for fingle men. John Smith, the current Town Crier of Kilwinning in Ayrshire, Scotland recounts that criers were also used to issue warnings and acted as conveyors of local news. In Haddington, East Lothian, after a fire which destroyed one side of the High Street in 1598, the “Coal and Candle” proclamation was introduced. This was an instruction to the towns people to acquaint themselves with every device for fire prevention. The proclamation was announced by the town crier nightly except Sunday from Martinmas (the feast of St. Martin of Tours celebrated on November 11) to Candlemas (observed on February 2nd). and banishing o’ this burrow town. tak’ warning by your neighbours by. Her Grease then 'aggravting her voice as gently as a sucking dove, called a halt, and a poor man who was at work on the road, was dispached the Hersham with all possible hast to learn what had become of this Excellency and to announce to him that the Duchess of St. Albans was waiting for the Grand Falconer of England.' away went Love's messenger at the top of his speed, incited there unto by the lagess of a splendid shilling; and as the beast way of discoveing the stray sheep. 'He went and told the bellman, And the bellman toll'd the bell.' But as the man described it, the lady had lost a grand falcon -- which they conjectured to be some great bird or other and to brevent the mistakes of the ignorant, the Town crier, first 'agitating the tintinnabularry clapper of the communicatator,' sonorously made proclamation to the following effect: -- O, yez! O, yez! Lost, stolen, or strayed, a great goose belonging, to the Duchess of St. Albans -- whosoever has found the same will please bring it to the crier, being of no use to any but the owner.' Strange to say, the announcement had the desired effect. A NEW METHOD to prevent depradations, fo often committed in this neighborhood. --- A gentlemen in Wales, who had in vain attempted to terrify intruders from entering his garden, by placing fteel traps and other engines, thought on the following devices:-- He wrote to a friend of his in London, an eminent furgeon, defiring him to fend down the first leg he fhould amputate. This request was foon complied with. In that part of the country it was ufual after fervice on Sunday, for the crier to proclaim, when is loft, &c. because at that time, the concourfe of people is greater then at any other. The leg was delivered to the officer, who, ftanding on a tomb in the church yard, and holding the naked limb in his hand, gave notice that it had been found the preceding night in J. M. Efq. 's garden, and whoever owned it might come and receive the property without punishment. Although no one appeared to claim the member, the fight of the mangled limb made fuch an impreffion on the minds of the fpectators that no drepadations were committed after in the gentlemen's garden or premifes, when produce was fecured by this artifice. In Boston, the city's last official Town Crier, James Wilson, opened the first tavern. The Bell in Hand Tavern is the oldest continually operating tavern in the United States (1795) and is located in Boston next to the Union Oyster House near Faneuil Hall. This isn't the pub's first location though. It was originally opened on Congress Street and moved to Devonshire Street before settling on Union Street, its current home. "Old Jimmy" Wilson was said to have had the best ale in Boston at the time, and today, they still serve Bell in Hand Ale. Based on the crowds that gather many nights, the spirits are still just fine. "Old Jimmy" actually announced the Boston Tea Party, the birth of a nation and had a tavern frequented by Daniel Webster, Paul Revere and William McKinley. The image is of the the original sign which huge outside the pub until recently. "You prisoners that are within, who for wickedness and sin, after many mercies shown you, are now appointed to die tomorrow in the forenoon, give ear and understand that in the morning the greatest bell of St Sepulchres shall toll for you in form and manner of a passing bell, to the end that all godly people, hearing that bell and knowing that it is for your going to your deaths, may be stirred up heartily to pray to God to bestow His grace upon you while you live. I beseech you for Jesus Christs sake to keep this night in watching and prayer for the salvation of your own souls, while there is yet time for mercy, as knowing tomorrow you must appear before the judgment seat of your Creator, there to give an account of all things done in this life and to suffer eternal torments for your sins committed against Him, unless upon your hearty and unfeigned repentance you find mercy through the merits, death and passion of your only Mediator and Advocate, Jesus Christ, who now sits at the right hand of God to make intercession for as many of you as penitently return to Him." "Robert Dow, Citizen and Merchant Taylor, of London, gave to the parish church of St Sepulchres, the sum of 50L. That after the several sessions of London, when the prisoners remain in the gaol, as condemned men to death, expecting execution on the morning following; the clerk (that is, the parson) of the church should come in the night time, and likewise early in the morning, to the window of the prison where they lie, and there ringing certain tolls with a hand-bell, appointed for the purpose, he doth afterwards (in most Christian manner) put them in mind of their present condition, and ensuing execution, desiring them to be prepared therefor as they ought to be. When they are in the cart, and brought before the wall of the church, there he standeth ready with the same bell, and after certain tolls rehearseth an appointed prayer, desiring all the people there present to pray for them. The beadle also of Merchant Taylors Hall hath an honest stipend allowed to see that this is duly done." The Beadle was originally a title given to a Saxon officer who summoned householders to Council. The term has an interesting etymology coming from Medieval Latin: bedellus meaning "to herald. It appeared in Middle English as bedel; in Old English it was bydel and in Old French it was also bedel. Webster's Revised Unabridged Dictionary (1913) defines beadle as "A messenger or crier of a court; a servitor; one who cites or bids persons to appear and answer; -- called also an apparitor or summoner." The Beadle rarely worked alone, usually accompanied by one or more constables to protect him during his often unpleasant duties. Contemporarily it refers to a parish constable; in the Scottish church one who attends the minister during divine service. Beadles are often found in Shakespearean plays and a famous fictional constabular beadle is Mr Bumble from Charles Dickens classic Oliver Twist or the loathesome Beadle Bamford from Sondheims musical Sweeney Todd. Currently, most Town Criers are officially appointed by the Mayor, a Town Council or by an historical group. Generally the style of uniforms is authentic and often date back to the 17th Century. Traditionally, the Town Crier's robes are historically similar to those of the mayor from that period, and uniforms are usually designed, incorporating the colours and heritage of the Crier's town. The choice of uniform is not limited to these robes, many appearing in the dress of a constable, military officer, voyageur, gentlemen or lady, or other selection. If worn, the ceremonial tricorne hat is adorned with curling feathers, a traditional representation of the quills used by earlier town criers to write their proclamations. Announcements are always preceded by the traditional "Oyez! Oyez! Oyez!" (which is usually reported to mean "Listen!" or "Hark!" in ancient French. If truth be told, "Oyez" can be found in the book of Isaiah. Chapter 55, verse 1 begins with a Hebrew phrase pronounced "Oyez-Ho". "Oyez-Ho, take notice of it. He that has ears to hear let him hear." It is often translated as "Come" or "Gather near.") and conclude with "God Save The Queen!" or (where this Crier works) “God Bless Canada!” To gather onlookers, a bell is sounded by the bell-man for the traditional three rings that open a proclamation. This attention-getting device is often replaced by hunting horns, bugles, fifes, drums, pots-pans or pipers, all of which share in the heritage traditions of the crier. Although we have access to many different, almost instant, types of communication these days there is still a place for “communication with a human face”. Town criers are used to lead parades, open supermarkets, launch ships, attend official functions and act as ambassadors of good will on any occasion when a flamboyantly dressed character can be deployed to draw attention to what is happening. Have Bell and Gavel --- Ready and Willing to Travel!